I learned to make Badham Kheer from my mother. Its an easy sweet drink to make that works for many occasions. Life has been so busy lately, my father in law is visiting me and Shankar and Gopi are in the thick of school already. Appa has taken a major demotion from senior executive to taxi driver, ferrying his sons back and forth from school! I always have the most interesting conversations with my father-in-law, and one of our favorite subjects is that of the arranged marriage. People are always fascinated to know that my father-in-law and my father arranged the marriage between Shankar and myself. Growing up in Canada I expected to meet someone on my own, date them, and get married. The idea of arranged marriage was not nearly as accepted in the mainstream as it is today. It seemed archaic, 0ppressive, and wholly unromantic. My father would tell me that I would one day go from his home to my husband's home, which would frustrate me to no end as an independent career minded young woman. I felt that my opinion, or my expectations of equal partnership, romance, understanding and acceptance would never be fulfilled by the groom chosen by my parents. All of this for the simple reason that I felt my parents did not understand me, a typical thought of a young adult anywhere in the world. Add to this that my upbringing in Toronto was completely different from that of my parents who grew up in Madras. I was growing up in a society that I felt they didn't understand the pressures of. The stereotypical impression of arranged marriages is one where the bride and groom have very little say in the matter, but todays concept of arranged marriages has changed so much in North America it has become nothing more than an arranged 'blind' date by the boy and girls parents. It is only now after marriage that I can understand every single one of my parents sentiments which infuriated me as I fought the arranged marriage process. I wanted fireworks. I hated being set up with family friends whom I had known since childhood and never felt anything for. Somehow the search for the perfect man was hindered with all the restrictions placed on potential matches; brahmin, iyer, brahacharanam, non-lohitha gothra, masters degree, tamil, etc etc etc. It began to feel like looking for a needle in a haystack. Once my parents convinced me to set up my profile on the internet the alliances came flooding in. Amongst all my girlfriends going through the same process the question of the moment became, "How do you know he is the one?. 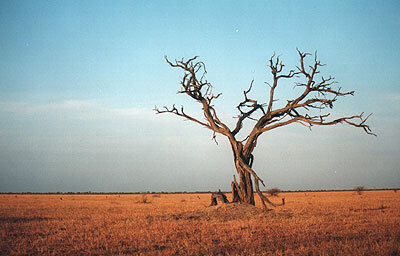 I see my friends who are still unmarried, and compare them to my friends who are married. I have a feeling in many cases the two groups can be described as those who have accepted that reality is not perfect, and those still searching for the illusion of perfection. Marriage is about accepting each others flaws and appreciating your life partner for who they are. I think it was ironic that while I was in the process, I was seeking perfection yet expecting the men I met to accept my flaws. At the end of the day I am very happy I ended up choosing family, culture, and lifestyle as important factors to base a marriage on. My father in law appreciated the badham kheer I made for him, the recipe taught to me by my mother. Its a wonderful feeling that I never anticipated to be part of the equation of marriage. I probably knew Shankar was the one even before I met him, the moment of knowledge being when I met his family and felt comfortable amidst them. I pose the question to you dear readers, how did you all know he was the one? 1. Soak the almonds in hot water for 10 minutes. The skins should snap off easily, peel them. 2. Grind the almonds, with the milk. 3. Simmer the almond mixture for about 15 minutes, and then add the sugar mix until the sugar melts. 4. Garnish with a pinch of saffron. beeeeyooootiful pic, the first one, Kanch! 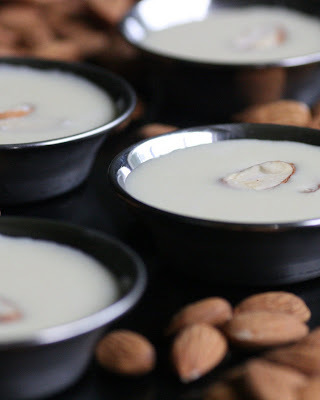 these have to be your best pics - ok, so may be i am a little biased because its badam kheer. my amma has this compulsive need to cook payasam for any special occassion - and i insist that she make badam kheer, the only payasam that i like. i got married over a year back when i least expected i'd get married. both my parents and i were very comfortable with satish and his family - it dint feel like we were interacting with strangers. there was just no reason to say "no". the concept of arranged marriages in india pretty much works like "blind date" - and there is typically a courtship period of 6 months between engagement and marriage. this gives enough time to get to stage where to come to love a person - and adore even those little flaws. kanchana, thanks for linking jugalbandi. your FIL is a lucky man to have you as a DIL. as for how i knew J was the one for me, i went to visit him - just as a friend - dozed off, and woke up to the aroma of banana bread from the only cookbook either of us owned (he owned it). a cute, very sharp, funny guy who can bake bread - what more can one ask for? Intuition! Thats what I say to all my unmarried friends. You just feel. There are no rules at all. I was all ready for my parents to look for a groom for me... I also had my doubts of how they are going to find the perfect groom for me, but i was comfortable knowing that the final decision rested on me.... so they began their search. When I was a kid my grandma used to make this and we cousins simply LOVED it! Only, I thought it was "dadangir" and would keep asking for it. My kind cousins didnt correct this because it provided them with so many laughs, so it was a while before I realised that it was "badam kheer". :D LOVE to drink this cold, like a thickshake. Kheer looks very yummy Kanchana. And so simple to make also. Badam Kheer looks yum, enjoy. A very nice read. Like you I was very apprehensive of arranged marriage too and did not have an arranged one. 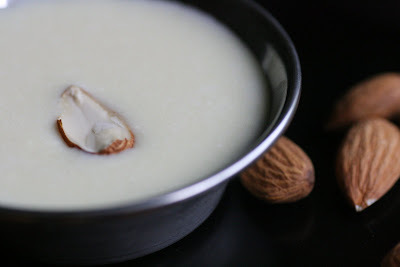 Firstly Your badam kheer looks amazingly delicious. They say oppasites attarct n i guess thats wht did the trick for us. We still r trying to find the common tings between us n it doesnt really matter coz we still hv matching wavelength. aah! badam kheer... my fav! It was really nice to read your post. Especially where you have written accepting eachothers flaws. Hey if i was you FIL , i would be also very happy to get the kheer. When ever i come to you blog and see your pic, i always say in my mind this is a very loving sweet girl. 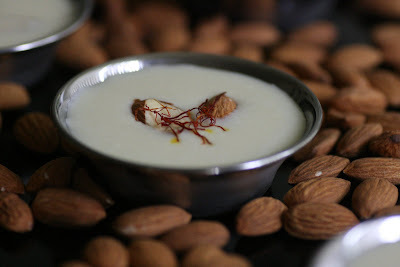 The badam kheer and the story brought a smile to my face, coz this is what we prepared when my husband and inlaws had come home the first time after we were engaged! :) I got married to my best friend but today, somehow it doesn't matter how it all began. So long as there is love, understanding, and trust, I know that he was always the one! Looks great Kanch! Love it and the pics look great! Me and my husband had an arranged marriage too. Not expected, especially knowing my personality! All my friends were wondering if i was nuts. I really did not do much thinking then - its actually going to be 10 years since we were married. My only 3 crazy criteria were: looks ok, can speak good english and has a good voice! Go figure! In fact i only saw his pictures and did not see him until 10 days before the wedding. You're right, marriage is a lot of understanding and compromises. But we've come a long way, and i would not do it any other way all over again! lovely pics. very rich and delicious looking. I am a new kid in this blog and my bolg is still in construction. You have a wonderful Blog here. Beautiful pictures and your recipies are good too. I have tried your rava iddly - fantastic. Nice reading your thoughts about the arranged marriage. I'll ditto it from the boys side! But with M beside me, I wouldn't want it any other way! When I see my single friends now, I sense a sadness in their eyes - like they are in a race to somewhere and not going to make it. I wish I could just wave my hand and make them all happy! Hi ! I am Vaishnavi , nice blog you have set up ! Lovely pics, and nice perspectives. I had a love marriage myself, we met in school, yep ! When we were 16 and somehow made it thru all the transistions of college, work, distances etc and here we are married today for 3.5 yrs now ! Neither of us are perfect, but we enjoy each other's imperfections I guess, so its working out well. :) ! Yummy picture. Tried it and it came out very well. Mine is an arranged marriage. I am lucky to get R as my husband. Both of us know each other's strengths and weaknesses; Life is all about accepting people as they are and most important enjoying the discrepancies. Hi ur badam kheer is looking yammy gonna prepare one and have right away. Well said all of you!!! Hello... was actually visiting this blog looking for a recipe, but ultimately, started poking around and enjoyed reading some of your non-food related comments! I think I have kind of had a similar upbringing as yours, and its really nice to read your thoughts... Cheers! I just stumbled upon this post while googling kheer recipes and HAD to comment. First of all, the pictures on your site are fantastic! Oh yeah, so I'm a fellow Torontonian (but transplated to the US temporarily). Please do check out my blog, www.palatedesires.blogspot.com (it's still in its infancy). Accidentally hit your blog.Can't agree more on what you said about arranged marriage.I was all you said what you were minus one important factor "WISDOM" which my parents had which they had it from their parents etc. All I had was a 26 yrs of existence and experience when I was ready for marriage and certainly my elders knew more. coming to your interesting narration:Although, I agree that arranged marriages ensure similar customs and cultures/beliefs, I don't think people go in for arranged marriages based on only these factors. Its more like they want a person settled(Read Green card) in US or some other foreign country, educated with a master's degree abroad, above average looks. It is not wrong to expect all this but is hypocracy to say that the couple is getting married only for the sake of similar caste/family or whatever. This is what arrranged marriage looks to me apart from the fact that the similar beliefs. I am so proud of my husband,myself and our marriage. The reason being I did not marry him coz he has a fancy master's degree(he does not even have a master's degree; he is a bachelor in Engg degree holder) or coz he was abroad(we dated in the orthodox city of chennai!!) or coz he parents/family owned flashy cars. He is a Tamil Iyer and I am an iyengar. We married each other and had nothing 'fancy' about each other except our personalities. I am so proud that we have acheived almost everything that these so-called-blind-dates(huh!!!) couples have. Yes,We got an oppurtunity to go the United States soo after our marriage and now we are on our way settling here. I am not ridiculing the feelings of everyone who has written here, just trying to say that there can be a great life without an arranged marriage too. Coming to the question, Yes I knew that this guy was definitely of my wavelength but only after marriage of a couple of years or so we realized that we are for each other. BTW, you look very similar to my cousin sis(an Iyer too!!) and on a first look I thought that it was her. Awesome looking kheer kanchana. I did make badam burfi but not the kheer yet.. soon will give it a try!